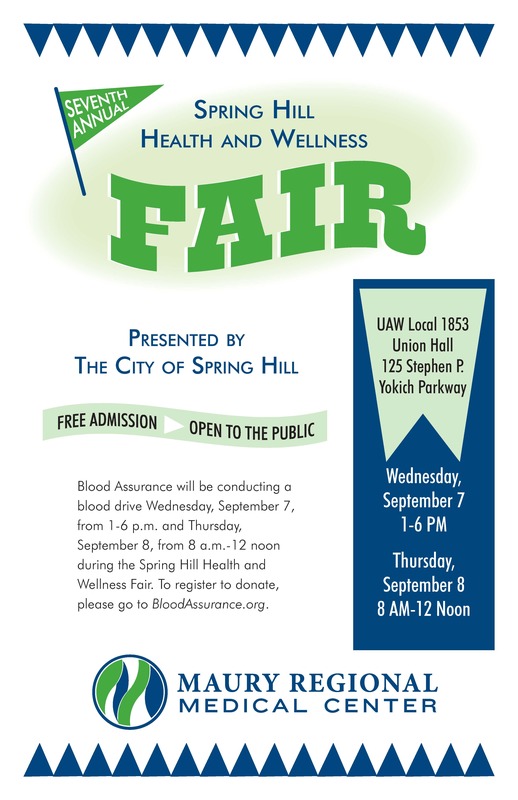 We hope you'll join us for this year's City of Spring Hill Health and Wellness Fair from 1:30 - 6 p.m. Wed., and 8 a.m.-noon Thursday, Sept. 8, at the U.A.W. Hall, 125 Stephen Yokich Parkway, in Spring Hill. This year's event brings vital information to our city employees and the community, plus it’s a lot of fun! Medical screenings will be available to assist with recognizing areas of focus that have the greatest impact on our health. Local health and wellness service providers are encouraged to host a booth and share their area of expertise. Blood Assurance will be on hand to accept donations on both days of the event. To participate, please complete and return the attached Reservation Form along with a $50 booth fee. Booth space is limited and reserved on a first-come basis. Booth space is not reserved until payment has been received.